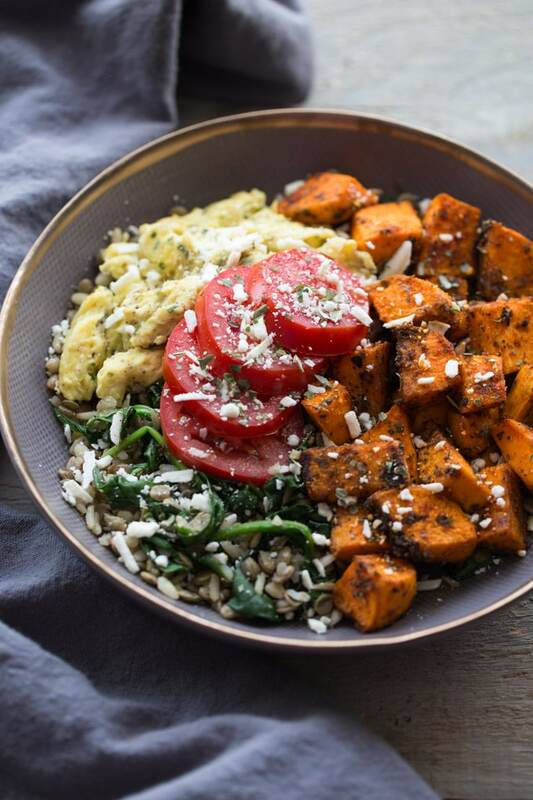 Whether it’s for breakfast or breakfast for supper, you need these simple and filling Spicy Sweet Potato Breakfast Bowls in your life! Seriously, savoury breakfast bowls are totally changing up my morning routine! Prior to a few weeks ago, I enjoyed the occasional savoury breakfast. Breakfast sandwiches and skillets, prepped ahead of time, are totally awesome. But rarely did I crave a savoury breakfast in the wee hours of the morning. A savoury brunch at 11am? No problem. But at 7am? I much prefer something sweet and fruity. We’re talking smoothie parfaits, chia jams (with peanut butter, of course) and french toast bakes. 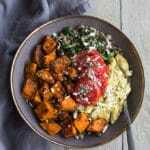 But that has all changed since I started making these Spicy Sweet Potato Breakfast Bowls. Loaded with spices and garlicky flavour, these bowls have been on repeat in my house lately. Diced sweet potatoes (okay, this one is pretty obvious). Lentils. Super filling plant-based protein. I prefer green, but you can definitely do red. (I also threw in some brown rice that was leftover in my fridge). Scrambled eggs. Because every savoury breakfast bowl needs scrambled eggs. (You can totally add a fried egg, but they’re just not my thing). Spinach. You gotta get those greens in where you can. Tomatoes, avocado, feta cheese, basil, or whatever toppings you like. If you make this recipe, be sure to let me know what you think in the comments below! 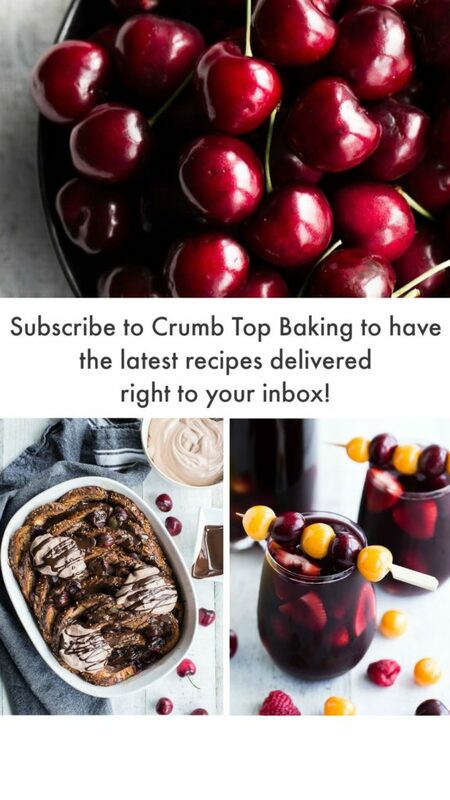 Or take a pic and share it on Instagram by tagging @crumbtopbaking! Whether it’s for breakfast or breakfast for supper, you need these Spicy Sweet Potato Breakfast Bowls in your life! 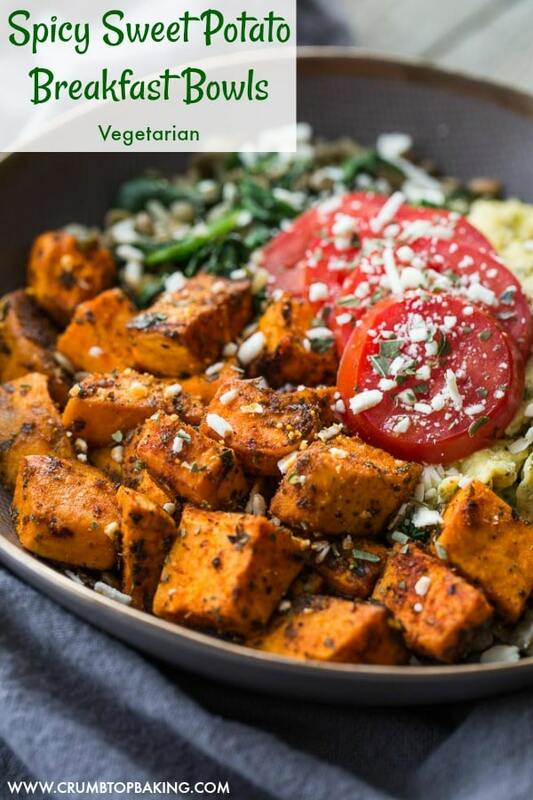 Garlicky and spicy, these vegetarian bowls are packed with lentils, spinach, eggs and sweet potato, and help you get your fill of fibre and protein! For the sweet potatoes: Pre-heat oven to 400 degrees and line a baking sheet with parchment paper. In a medium-sized bowl, add the cubed sweet potato and drizzle with oil. In a small bowl, combine the oregano, garlic powder, paprika, cumin, salt, pepper and cayenne pepper. Coat the potatoes with the spice mixture, spread out on baking sheet and bake for 15-20 minutes, or until tender. For the eggs: Pre-heat frying pan with a drizzle of olive oil. In a small bowl, whisk together the eggs, chives and a dash of salt, pepper and garlic powder to taste. Add to frying pan and cook on medium heat by gently folding over the eggs a few times until cooked and scrambled. This should only take a minute or two. For the lentils and spinach mixture: Cook lentils according to package directions. Pre-heat a frying pan with a drizzle of olive oil. Add the spinach and cooked lentils, and add a dash of salt, pepper and garlic powder to taste. Cook on low heat until the spinach is sautéed. This should only take a few minutes. Assemble the breakfast bowls: Divide the lentil and spinach mixture into two separate bowls. Layer on the sweet potatoes and scrambled eggs. Add the optional toppings and serve. These bowls can be made ahead and warmed in the microwave before serving. Just reserve any optional toppings and add when ready to eat. If you’re not a fan of lentils, or want to mix it up, you can also add some cooked quinoa or brown rice. That’s a whole lotta goodness packed in there! I don’t think I’d have time to prepare this in the morning (weekdays, that is), getting up at 5:30-6am, but I would definitely prepare the night before for lunch the next day! A good helping of Greek yogurt on top and I’d be set (oh, and extra extra avocado – I’m obsessed 😉 ). Have an awesome weekend, Leanne! I hear ya Dawn! This isn’t an every day breakfast, and it’s definitely nice to prep the night before! And totally agree – yes to lots of avocado! Happy weekend to you too! Looks amazing! May have to try it this weekend . Thanks Michael! Hope you get a chance to try it! Happy weekend! 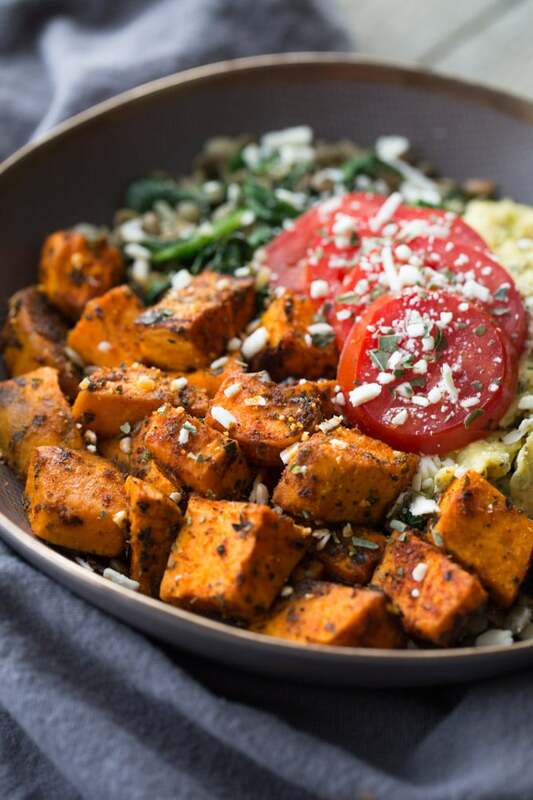 You best believe I need this sweet potato bowl in my life. Heck, in my mouth is more accurate! I tend to eat scrambled eggs for breakfast every morning so it’s fun to find new recipes to change up my routine. These sound awesome! Thanks Christina! This is definitely a nice way to change up your scrambled egg routine! Hope you get a chance to make it! This has everything I’d want in a savoury breakfast bowl! I love, love, love sweet potatoes and with the eggs it changes things up so nicely – can’t wait to try this recipe out this weekend! Thanks Jessica! I hope you like it! If you try it, be sure to let me know what you think! Happy Saturday! This looks and sounds so refreshing! I’m much more of a sucker for savory breakfasts, so this is right up my alley. And you can’t go wrong with a bowl meal! Thanks Dana! I lean more towards a sweet breakfast, but I’ve been enjoying this savoury bowl lately! And yes, it’s great to have it all in one bowl! I would eat this dish for breakfast, lunch or dinner! It looks and sounds delicious, Leanne. It is certainly versatile and customizable for any guest. Thanks so much for sharing. Thanks Denise! I’ve enjoyed this for breakfast, lunch and supper! It’s definitely versatile! Thanks for stopping by. Have a great weekend! Bring on the lentils! It definitely makes this bowl super filling! And I totally agree about the sweet potatoes. The first time I made this, I ate half the sweet potatoes before I even assembled the bowl! Happy weekend Katherine! This is such a beautiful and delicious breakfast Leanne. I love this recipe, it sounds fantastic….going to try it out for breakfast tomorrow and I know that everybody will absolutely love it too. Thank you for sharing this AMAZING recipe. Thanks Ashika! That’s so nice to hear. I hope you and your family liked this recipe. Enjoy the rest of your week! I love savory breakfasts like this but I need to plan better in order to throw something like this together on busy week days! These bowls are so pretty — love the colors and all the ingredients you used! Thanks Marcie! Totally agree. I need to plan to make this during the week. A little bit of prep at night goes a long way in the morning! Wanna know something crazy? I’m not a fan of sweets first thing in the morning. I’m all about a savory breakfast and this one looks incredible. I’m obsessing over sweet potatoes lately so I’ll have to try this! Thanks Kelsie! I hope you get a chance to try this recipe! 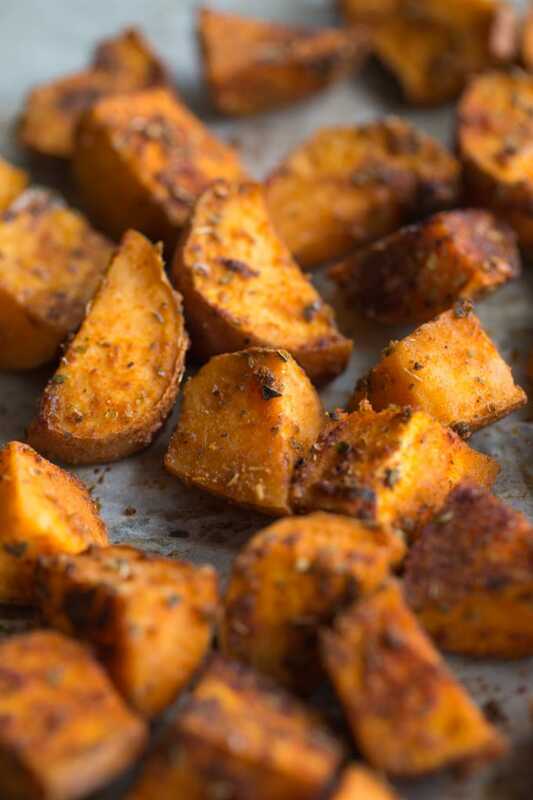 I’m also obsessed with sweet potatoes lately, and the spicier, the better! Have a great week! This is such a perfect breakfast idea, Leanne. I’ve never considered having sweet potatoes for the start of the day. Thanks for the idea! Thanks Agness! 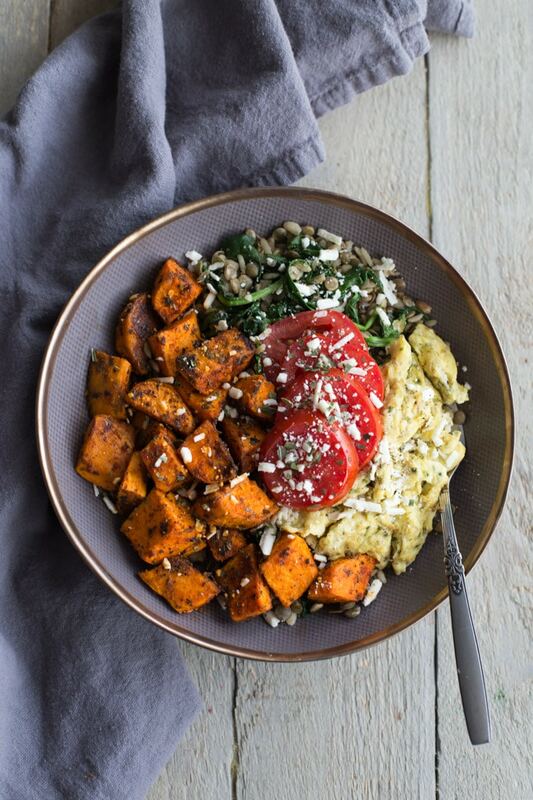 Sweet potatoes are a great addition to savoury breakfast bowls. You should definitely try it some time! You may have just converted me to a savory breakfast girl too with these bowls! They look so delicious!! Thanks Helene! A savoury breakfast is definitely a nice change! Happy Monday! Already saved this and hopefully make it tonight. It sounds too good to pass. Especially those potatoes. Thanks Stefanija! Hope you like it. Let me know how it goes! I am very happy! I just happen to have everything I need! Who knew….sweet potatoes for breakfast? Love it! Sweet potatoes are great for breakfast! A little bit of sweet and a little bit of savoury! Hope you get a chance to make it Annie! I think I’d enjoy this bowl for breakfast, lunch or dinner Leanne! Great ingredient list and so hearty! Thanks Mary Ann! It’s definitely a bowl I’ve enjoyed for every meal. It’s even hearty enough for supper! Have a great week! Love this recipe Leanne! There’s just something about sweet potato for breakfast and I’ll be saving this one to make for sure! Thanks Tanya! I love sweet potatoes for breakfast! Be sure to let me know if you make this! Happy Monday! Thanks Puja. Hope you get a chance to make it! Sweet potatoes with milk sugar and banana sounds great. I’ll have to give it a try some time! I love everything about this bowl, as I am such a big savoury person! I am totally gonna try this soon with some avocado too, because avocado is LIFE! Oh yes, try this with avocado. It’s so good! Thanks Jaclyn. Have a great weekend! Thanks Heather. It is pretty filling! But I love my PB&J too! Have a good one! Thanks Michelle! I love to make this when I need to change up my breakfast a bit! Hope you get a chance to make this recipe! Happy Sunday! as someone who is always in the search for vegetarian recipes like this one, thank you so much for posting this!! I am absolutely inspired to make similar!!! Since this is dreamy! Thanks Camila! Happy I could provide some inspiration! I’m sure you will make a delicious version!